In 1886, Pasteur presented a note on the work of the Italian chemist Arnaldo Piutti concerning the difference between the two physical isomers (enantiomers) of asparagine. The octahedral crystal of asparagine appeared only as “levorotatory hemihedralism” but, in principle, should also exist as a dextrorotatory asparagine with a symmetric crystalline form. 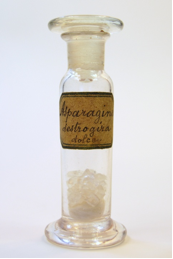 In 1886 Arnaldo Piutti isolated the dextrorotatory asparagines while he was working as an assistant of Ugo Schiff in Florence. He obtained also another unexpected information, of which only Pasteur immediately understood the importance: the dextrorotatory aspargine had a sweet taste. The dextrorotatory sweet asparagine of Arnaldo Piutti is conserved in the Schiff Collection of the Department of Chemistry “Ugo Schiff” at the University of Florence, and is the first compound where a relationship between the optical isomerism of a molecule and a different response of human receptors, in this case the taste, was observed. Laura Colli was born in Florence in 1977. She graduated in Philosophy and subsequenty in Diagnostics for Cultural Heritage. Since 2008 she has worked at the "Ugo Schiff" Department of Chemistry at the University of Florence. She deals with the history of science, museology and conservation of scientific collections. She is curing the chemical collections of the University of Florence.